It’s a bit surreal. The beautiful green and mowed pitch next to the decayed main stand. Despite the fact that there is road next to the stadium it is surprisingly quiet around the ground. The fences are closed, but this time it doesn’t bother me at all. Today I will capture the beauty of De Wageningse Berg, stadium of former FC Wageningen, from a whole different perspective: the sky! No official matches are played in the stadium since 1992. To maintain this unique ground a group of volunteers does annual maintenance to the stands, so Mother Nature doesn’t take over. An initiative which is really awesome. The ground is a brilliant piece of football history. It must not be teared down by a money driven real estate company. The ground has more than 100 years of football history. In 1899 the nearby hotel arranged a sport ground with a 400 seater stand. Probably the first sport ground in Dutch history. 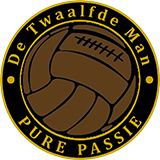 Because of modern football, increasing commercial interests, FC Wageningen went bust and disappeared from professional football. De Wageningse Berg is their legacy, their history. Enjoy the aerial footage!